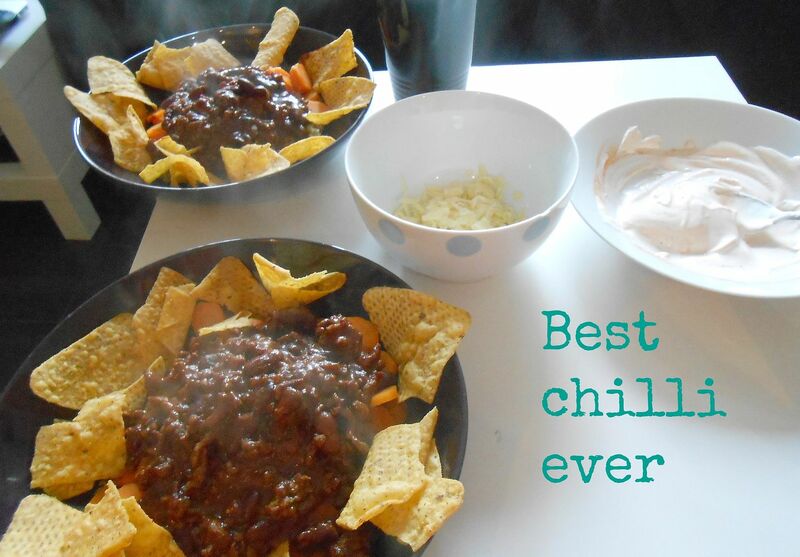 Recipe: My best chilli ever. I’m not trying to brag, but this is the most delicious chilli ever. I make it from scratch and it’s so yummy. When I make it, I fry the onions using 3 sprays of 1 cal oil, and fry them lightly until they’ve turned a golden brown colour. While I’m doing that I cook the Quinoa – I do 40g per person and then use 100ml of water per person. You can see when it’s cooked. Quinoa is awesome, it absorbs the flavours of the chilli so well. It’s also really healthy – so much protein, fibre and iron and it doesn’t make you bloated or sleepy like rice/pasta can. I always cook chilli with carrots because I think the flavours go well, so I steam those at the same time as well. Once the onions are done, I add the mince and cook it until it’s brown. I then drain it, because I hate the extra fat mince has even when it’s lean. I drain into a bowl so it doesn’t block the sink! Once it’s drained I add all of the spices and mix it in, and then add a square of a chocolate at a time, until it’s smoothly melted in. I then add the passata & kidney beans, and keep it simmering so it reduces a bit… normally leave it simmering for about 10 minutes, and then everything is done. I serve it with nachos a fair bit, you can scoop everything in the nachos and devour everything. So good! We normally have a bit of cheese to put on top, and I make Gemma’s garlic dip to go with it.